LIFESTYLE || Escape Reality Coventry. 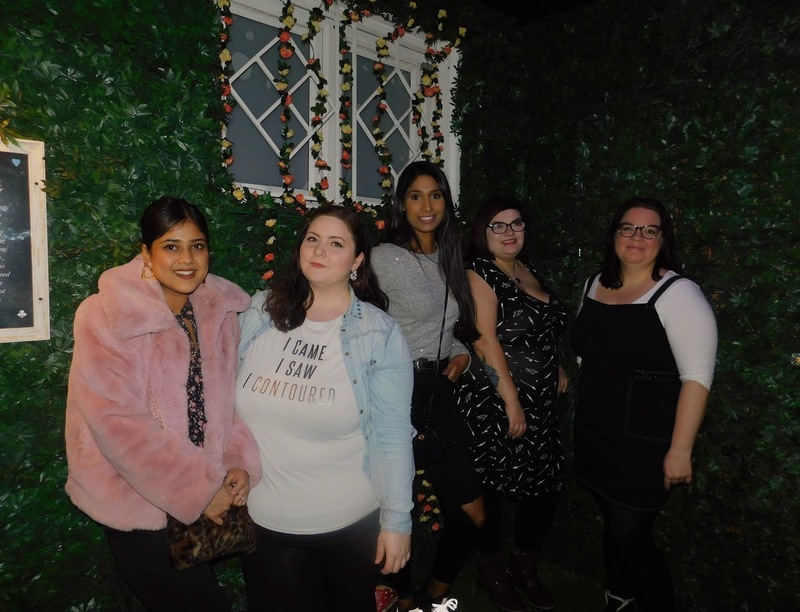 Escape Rooms are becoming one of most popular attractions across the UK and further, and Escape Reality is definitely a firm favourite from the reviews I've seen, and from my recent visit with the Covbloggers girls, I can see why! 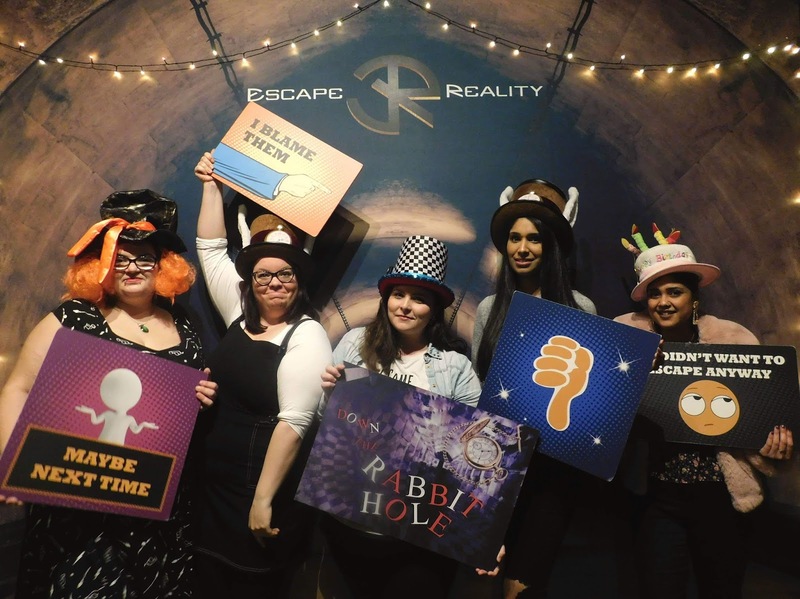 Escape Reality opened up in Coventry just over a year ago (they celebrated their first birthday in Summer last year), and have escape rooms all across the U.K and even some in the states and Dubai. They offer an immersive escape room experience, in their movie inspired rooms where you have 60 minutes to work as a team to solve riddles, puzzles and spot the clues in a race against time to escape the room. There are 8 rooms currently in their Coventry location... Jungala, Scarlett, The Asylum, The Heist, Alcatraz, Murder in Whitechapel and their two newest rooms... Down the Rabbit Hole and Tortuga Pirates. We went along to have an attempt at the Alice in Wonderland inspired room, Down the rabbit hole. 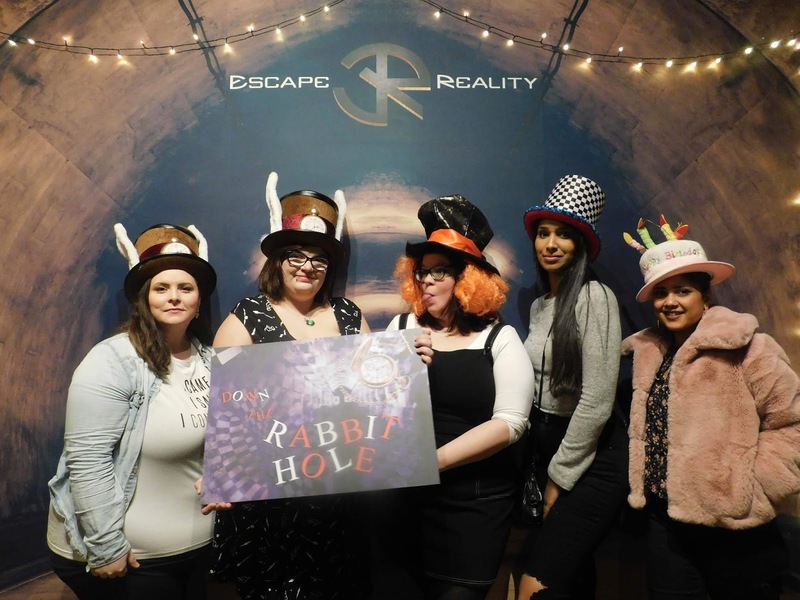 We had a mixed experience of escape rooms, some of us had never done any, one of us had done many and I myself had only done one before (I went to Escape Reality Coventry's first birthday party and did the Murder in Whitechapel room). For obvious reasons I'm not gonna go into too much detail about the room, as i don't want to give anything away. So the experience starts with you being taken to your chosen room by your Game Master, who provides you with a backstory and explains how the locks etc work and how to use the ipad they give you which has your countdown on it and the clue scanner. And then you enter your room and the countdown begins. 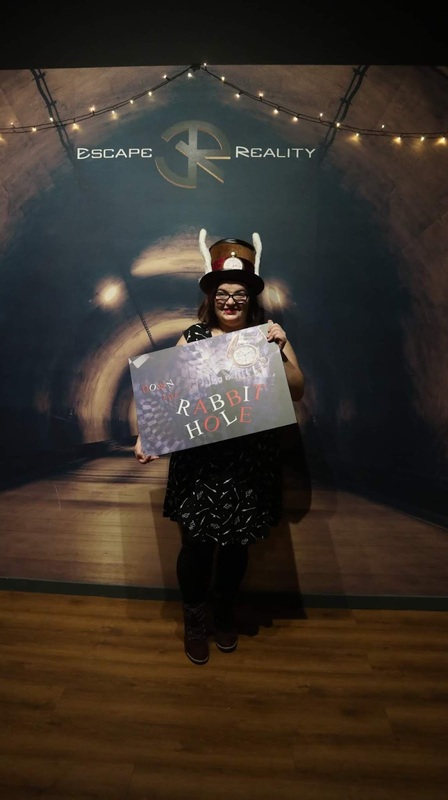 The entrance to the 'Down the Rabbit hole' room was amazing, and very fitting with the theme, definitely sets a scene and brings the story alive. The rooms were beautiful, you can clearly tell how much thought and passion had gone into bringing this idea to life and personally that makes the experience even better for me and just adds that little extra that makes it stand out. 'Down the Rabbit Hole' is a 5 star rated room, which means it's a super challenging room and definitely probably one of their most challenging rooms. And we definitely found it challenging, we didn't beat the clock but it was a lot of fun and generally a great experience overall. I'd highly recommend this room if you really enjoy a challenge and I definitely wanna go and attempt it again, see if I can beat the clock this time around. The staff are really a credit to the company, and it was great chatting to them about the company and the rooms they have etc. It really makes a difference when you visit a place and the staff are friendly and passionate about their job and the company they work for. They were happy to answer any question we had and their passion for their job was infectious. Again, I can't recommend this place enough, Escape Reality has really impressed me on so many levels and I will be going back soon to attempt some more rooms... Just gotta pick my team! Its located perfectly in the city centre, meaning its easy to get to and from and plenty of places to eat or drink at near by before or after. They do have a bar at escape reality with a selection of soft and alcoholic drinks to choose from. You can also request a popcorn bar with the most delicious popcorn from Joe Seph's that's just divine, we tried some of the salted caramel one when we went and it was heavenly. I've also tried the cheese and onion popcorn which tastes likes Wotsits and is just divine. Their open Monday to Thursday from 1:30 - 10:30 and Friday to Sunday from 10:30 - 10:30. The prices depend on the number on players in your group, starting from £22 each for 2 players and down to £16 each for 6 players. And there's also offers and deals for events or larger party's, to find out more about that email them at coventry@escapereality.com. Also atm till February they have an offer on for Mondays and Tuesdays, to find out more about this offer and more go check their social media pages. Also their website has a really helpful beginners guide if it's your first time going to an escape room and want a few helpful tips on escape rooms. Overall, I had a blast at Escape Reality and honestly can't recommend them enough... Definitely a 5/5 experience for me and can't wait to go back. Have you done any escape rooms before or been to escape reality? 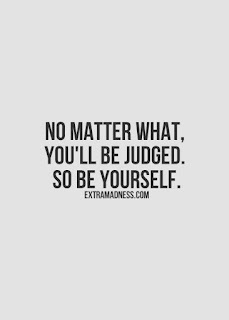 As always let me know in the comments below. Oh my gosh I'd love to go to one of these one day! 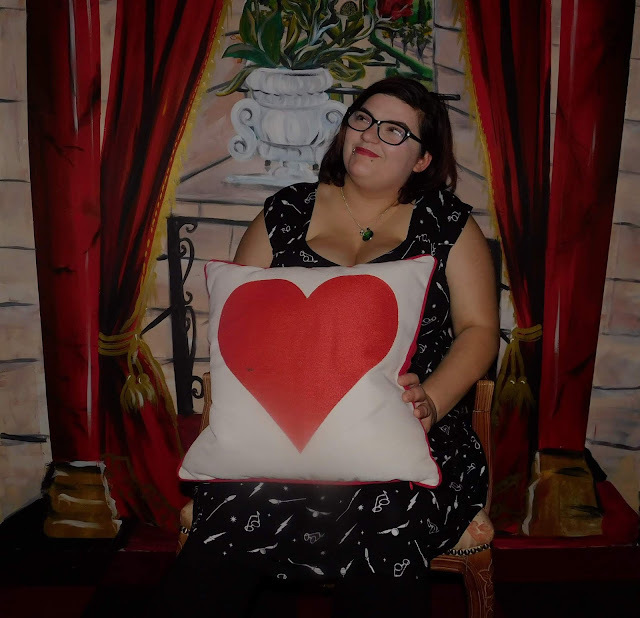 I went to one in Birmingham and I loved it! I loved it and can't wait to go back! This one was so tricky but so fun! Aw I loved Escape Reality in the summer, and I’m dying to go back! Looks like you had so much fun! I’ve been here before and had a great time. It was a long time ago though and didn’t realise they had so many new rooms. Some cool sounding themes too, will have to check it out.